Automatic Die Cut Platen Machine (LS-1450, LS-1670) - Ming Wei Paperware Machinery Co., Ltd.
Thickness of cardboard: (1 - 8mm) F-A+B. Maximum sheet size: 1,450mm x 1,000mm. Minimum sheet size: 540mm x 360mm. Maximum cutting size: 1,420mm x 980m. Maximum operational pressure: 350 tons. Weight of machine: 25 tons. 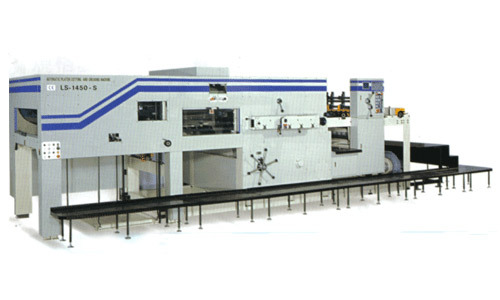 Size of machine: L 7,875 x W 3,600 x H 2,325 mm. Maximum sheet size: 1,670mm x 1,150mm. Minimum sheet size: 600mm x 400mm. Maximum cutting size: 1,650mm x 1,130m. Maximum operational pressure: 400 tons. Weight of machine: 29 tons. 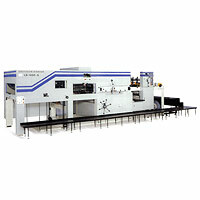 Size of machine: L 8,620 x W 2,720 x H 2,325 mm.